TORONTO - One of the men accused in the VIA Rail terror plot wants a lawyer who will ensure he is judged by the “holy book” — not the Criminal Code. Dressed in orange and donning glasses, a bearded Chiheb Esseghaier appeared in court via video Monday morning. The court heard that his Legal Aid application is still pending and a lawyer refused to represent Esseghaier because of his conditions. The 30-year-old Montreal resident interrupted by saying “excuse me” three times to clarify. He has also not yet received disclosure about his case. During his last two court appearances, Esseghaier did not hesitate to speak out against Canada’s Criminal Code. “I don’t want (a) book written by humans,” he said in court on May 23. After the RCMP arrested them in April, Esseghaier and his co-accused, Raed Jaser, 35, of Toronto, were charged with conspiring to murder unknown persons, aiding a terror group, and interfering with transportation facilities for a terror group. 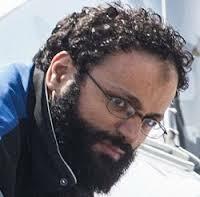 Esseghaier was additionally charged with instructing someone to take part in a terror group between Sept. 7 and Dec. 20, 2012. He is scheduled to appear in Brampton court on June 10 in relation to an application by various media outlets to unseal search warrants. His next Toronto appearance is via video in Old City Hall court at 11 a.m. on June 25.